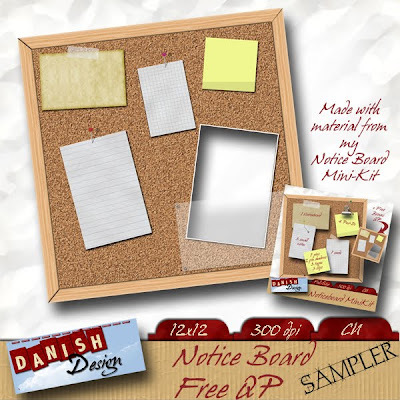 As promised - although in the eleventh hour - here is the last free samplers for my new Danish Design products available at Scrap It Sassy. Please notice that both samplers are CU OK - TOU is included in the download. Remember that ALL my designs @ SIS is on sale until the end of August - 50% off on everything! 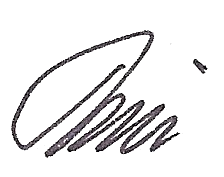 Click on Ad to get to my sale. First up is a QP made with the material from my Notice Board Mini-Kit. This QP is also added to the Mini-Kit so if you have $ 1,25 to spare go buy the whole kit on sale and get all the material used plus much more to make your own notice boards. 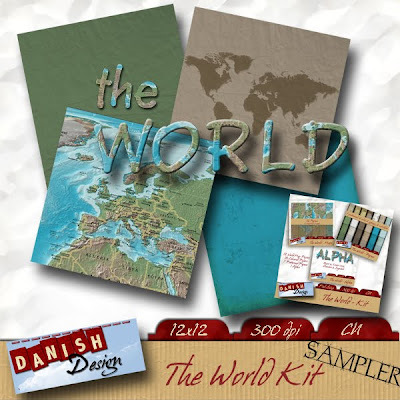 Then a sampler with material from my The World Kit. You get 4 papers (2 coloured and 2 map papers) plus a WordArt to demonstrate the Kit’s alpha. Again my August Sale makes it possible for you to buy the Kit for only $ 3 and the individual parts for only $ 1,50 each. That’s it for today - hope you will enjoy it. As you may have noticed it has been a VERY busy week for me and I need to take it slow next week. But with 17 freebies in the past week I assume you have plenty to work with for now. I’m not saying that I won’t be posting this week, only that it will be a lot less than the past week. Hope you can forgive me. just snagged the 2 most recent freebies. love both - thanks SO much!! Thank you so much for this post. 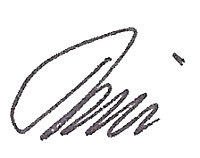 I want to let you know that I posted a link to your blog in CBH Digital Scrapbooking Freebies, under the Page 7 post on Aug. 23, 2010. Thanks again. I'm new to your site and completely addicted! I found your sample of The World Kit, but the link to the store no longer works. Is there a place where I can see the entire kit? I hope you get to read this.